One of my long-term tools when it comes to dealing with MusicXML files is SeeScore, which is a (paid, but there is a lite version) app that is a MusicXML reader. When I have an issue with a MusicXML file, I often need to determine whether the problems are created by the program that creates the MusicXML, or the program that is opening the MusicXML. If a score opens cleanly on SeeScore, I know that the problem lies with the app trying to open the MusicXML file; and if SeeScore doesn’t display it correctly, the problem was with the program that generated the MusicXML file. You might wonder why you would ever need this ability–but when it comes down to contacting a company for technical support, it is best to have all possible information available to you. In my opinion, SeeScore is the best MusicXML viewer on iOS…but it lacks features that would make it a replacement for apps like forScore and unrealBook, as well as the new generation of MusicXML and PDF viewers, such as Newzik and Gustaf. I do believe that the engine from SeeScore can be licensed by the company and used by other programs, much like the handwriting feature used by MusicJot and Notion. The company that makes SeeScore is Dolphin Computing, and they were kind enough to contact me a while ago and ask me to look at their scanning app, PlayScore. PlayScore comes in two versions…a Lite Version and a Pro Version. It is also available on Android Devices, much like NotateMe. You can find the PlayScore website at http://www.playscore.co. The app can use a picture that you take, or select a photo from your camera roll, recognize it, and play it. You can adjust the tempo, and you can even create a playback loop on the screen. There is also an accompaniment mode (great for singers) that ignores a melody line and only plays the accompaniment. In my trials using my iPhone 6S, the playback is very accurate. 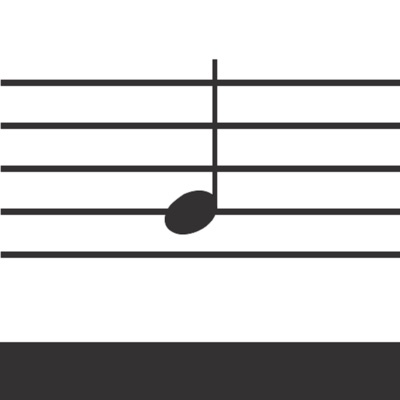 PlayScore does not seem to recognize repeats or multiple endings, nor does it attempt to recognize lyrics. Now, however, I have to talk about my use of scanning software, and in that context, where PlayScore needs to improve to be a solution for me. I recently prepared rehearsal tracks for our high school choir programs to use this fall. My tool Music Optical Character Recognition of choice is usually NotateMe, on my iPhone, as it scans music (with the camera) and pulls in most diacritical markings AND lyrics. It is incredibly accurate, even with large scores. There is clean up to do–but I am spared hours of entering things into a notation program. NotateMe is a $70 when you add the PhotoScore In-App Purchase, but it is a purchase that pays itself back in time within a few uses. Once I am done scanning, I can export the scan via MusicXML to Finale or Notion (ultimately, I use both) and I can honestly say that NotateMe is on my essential tools list. In truth, NotateMe didn’t arrive as a scanning app, but its scanning component is far more valuable to me than its notation component. PlayScore has potential, but it is lacking in three areas that I hope that Dolphin Computing will address in future versions. First, it can only work with one page at a time. Time is essential to me, so an accurate scan is important…but I typically want to scan, edit, clean-up, and then produce. I don’t want to keep going back between scanning and editing on the same song. Second, you have to use iTunes to copy files from PlayScore to anything else…and to be honest, many users don’t even connect their devices to iTunes any more. When you have Apple Music (or Spotify) for any kind of music you would ever want, and you buy streamed movies from iTunes or Amazon…why would you need to connect to iTunes? (Side note: if you still use iTunes, don’t feel bad…but many people don’t). PlayScore should be able to export directly out of the app to another app, AirDrop, or e-mail. Third, there is another app, Sheet Music Scanner, which is less expensive, and while it does not scan everything (e.g. Triplets, lyrics) you do get multi-page scanning, as well as the ability to import PDF files. I would like to see PlayScore add more features. If Dolphin does so, I will certainly follow up with another post. In conclusion, PlayScore is a photo-based scanner that scans one page at a time with great accuracy–but needs some more features before I could use it in my work flow. PlayScore would work well for someone like my dad (now 72) who sings in a male chorus and does not play piano. He likes to practice his part, and could use his iPhone and PlayScore to work though a score and practice on his own. You may recall that I reviewed the app What’s My Note, which is another intriguing app that scans music and allows you to play any note by touching it. PlayScore would be a better fit for someone who wants to hear all the parts at a set tempo. PlayScore might be the app you are looking for–and if so, you can buy it today on the Apple App Store or the Android Play Store. Every now and then, I get an e-mail from a developer about their app (as a note, when the e-mail comes from the developer and not a PR firm, it makes me more likely to pay attention to the app. There are four of five blogs [in total] that discuss apps for music education, and all of us link to each other. It doesn't take that long to reach out to us). Not all apps are easily applicable to music education, and I choose not to blog about some apps, particularly when I don't see the connection to classroom music (which to me also includes band, choir, and orchestra). The app I would like to bring to your attention today IS an app that is applicable to music education, and it is free without ads. It is a tuner called Bandmate Chromatic Tuner. My name is Justin Dickson. I am a middle school band director in North Carolina. I wanted to tell you about an app that I designed. It is called Bandmate Chromatic Tuner, available for iOS and Android. It is free, with no ads so it is safe for classroom use. It is a chromatic tuner that displays your note on a music staff. It is the only tuner that does this. Since launching in August, it has had over 36,000 downloads. It has been a game changer with my beginners. Being able to see what note they are playing has made it so much easier to learn how to read music and play the correct notes on their instruments. Bandmate is set up for every instrument that you find in school bands and orchestras, and handles transposition without the user even needing to know what transposition is. In other words, Bandmate is an app that you can use on your first day of beginning band / orchestra with basically no explanation or set up time from the teacher. Download it, turn it on, and go with your lesson. 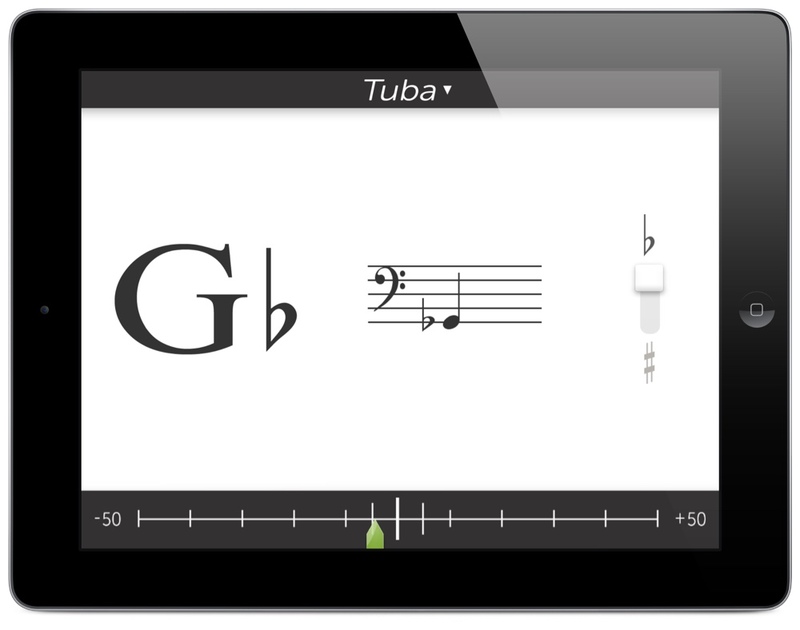 The unique element of this app is that it is a tuner that visually shows the pitch that is being played on the staff (with transposition in mind), unlike other tuners that show only the frequency. The only other app that comes to my mind that shows the pitch that is played is Magic Stave MIDI Recorder (or Magic Stave Free), but that app isn't a “tuner first,” are still iPhone apps (universal iOS versions are coming), and the free version is ad supported. I know there is a HUGE following for TonalEnergy Chromatic Tuner and I am NOT suggesting that you “bail” on that app. Sometimes it is nice to have multiple tools in the toolkit, and Bandmate is a nice addtion that is straightforward for beginning students (and beginning technology users) [As a side note, also check out Band Tools]. So…if you tune instruments…go download Bandmate Chromatic Tuner! Kim’s main point is that the Chromebook has a keyboard attached to it, again, something that makes the device generally useless for most music programs. And knowing the number of apps that can be used for music creation, where doing so is very limited on a Chromebook, music education lives in a reverse parallel universe from the rest of education. But then again, any subject without desks would feel the same way. In truth, the argument that iPads are for consumption is tiring; and if I was a Chomebook apologist, I would be upset that it was implied that the Chromebook wasn’t good for consumption either (Yes, you can use Netflix on a Chromebook, too). Addtionally, the first touch screen Chromebooks are out, too, which may lead to similar ways of interacting with apps on a Chromebook as on an iPad. Kim argues that the web ecosystem is better for education. HTML 5 apps are still not mature, meaning that can make more developed apps for iOS or Android, versus what can get on a web app. Furthermore, web apps eventually need to be profitable, meaning that they need to sell annual subscriptions (most common) or be ad driven (dangerous at school…how do you control what apps are seen?). Most iPad apps…in music education…are buy once, use forever (or at least for multiple years–usually at a 50% discount). iOS developers are also very open to feedback, meaning that they are willing to add features at the request of paying users whereas web developers may not. Again, in music education, the app ecosystem is better…and web ecosystems that run on a Chromebook tend to also run on an iPad (e.g. NoteFlight). Kim’s argument is that Chromebooks are better for collaboration. iPads can, for the most part, be used in every collaborative way that a Chromebook would be used. Furthermore, iPads can be mirrored via a dongle, Apple TV, or computer program…with new peer-to-peer mirroring without wi-fi this fall. I was never much of a fan of group projects in school, as I usually ended up doing the work for the entire group (to save the grade) or in self-selected groups, we would finish days before other groups. Music is collaborative in a others sense–everyone interacting with each other to create musical excellence, which at its core doesn’t even require technology. Again, until we see a Chomebook tablet (again, unlikely as Google is still committed to Android tablets), a choice of Chromebooks in your school is a statement that the “core” matters, and that music and other “electives” don’t need technology integration in your school. I do support a hybrid model of Chromebook carts and 1:1 iPads, with the option of students checking out Chromebooks overnight. My guess is that many students would not take advantage of that opportunity with 1:1 iPads. Sadly, Mr. Kim’s article focused on (hard to believe that. I would use this terminology, but it is accurate) old technology stereotypes, and ignored some of the existing positives of Chromebook, such as IT management, cost, and upcoming features and connections with between Chromebooks and Android L.
In January 2013, Musitek released its latest version of its music scanning/recognition software, Smart Score Pro X2. I own SmartScore Pro X, and downloaded the demo. I had also purchased Neuratron’s PhotoScore Ultimate, and on the pieces I used for comparison, PhotoScore Ultimate did a better job of scanning than SmartScore Pro X2, so I chose not to buy the upgrade ($99). 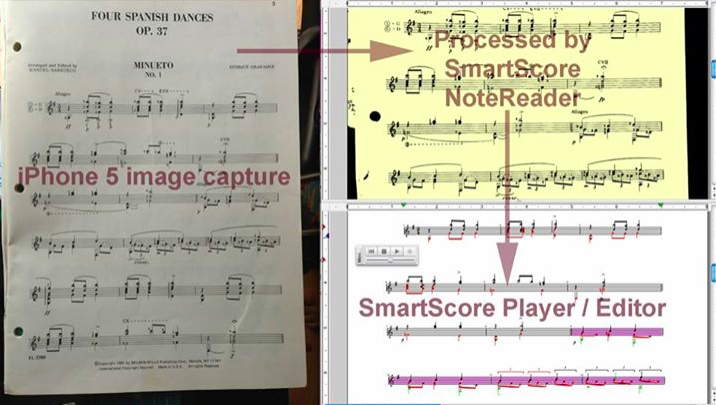 The text from the Facebook post indicates that this was using Musitek’s NoteReader App on Android, and apparently you still need to pull the data captured from the app into SmartScore itself to edit the data (no indication if NoteReader can export as a MusicXML file to another program instead). I hope the plan isn’t to force the user back to the computer–that defeats the purpose. 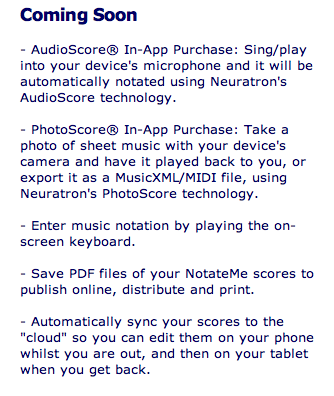 At the same time, Neuratron has just released a music handwriting recognition app, NotateMe (app link with referral), which also promises to add PhotoScore capability to the app in the near future. It is about time for music scanning companies to take advantage of mobile devices for their software, particularly as a camera (of high quality) is attached to the device and the guessing game of scanner quality will no longer be an issue. There is a time coming–in the VERY near future–where a desktop computer will no longer be needed to notate music. For me, this includes the tasks of writing music by hand (right on the tablet), playing music into the app (with an attached instrument), or scanning a paper copy of music (taking pictures of each page, converting to music notation). This is going to be even more true with coming 64-bit processors in all our mobile devices. Now, what I find interesting is that both Musitek and Neuratron have adopted an Android-first process (although the iOS version of NotateMe came out within weeks of the Android version). Perhaps that is because Android programming is more similar to desktop programming than iOS; or perhaps the iOS approval process is longer. Android apps in music education, to this point, have not been very abundant, whereas the iOS app selection for music education apps is overwhelming. I am not sure how the world will accept these “expensive” apps. For example, Notion for the iPad (app link with referral) is currently $16. NotateMe (app link with referral) is $13 (which is 50% off). Anyone who has bought a “full” version of software–notation, music recognition, etc.–will recognize the “deal” these apps represent. But the marketplace is full of free and ad-supported apps that reach a much wider audience (e.g. how many more people would download Temple Run versus NotateMe?). At any rate–interesting times lie ahead where your tablet really can be a computer replacement. Now–if we can only get Apple to let us save audio to the music library! Note: all app links on techinmusiced include a referral code that sends a percentage of the purchase price of the app to techinmusiced.com. No extra cost is added to the price of the app, so if you are going to purchase an app mentioned on techinmusiced.com, please consider doing so with the referral link that is provided. Paul Shimmons already posted about this, but there is a new app that converts written music to “printed” notation called NotateMe. It is by Neuratron, the makers of PhotoScore (the scanning software that comes with Sibelius). It is 50% off right now and will have future abilities to do music scanning (PhotoScore) right on your device (for an additional fee). I am purchasing this now and will blog more later.